Go here to enter the giveaway for a Kindle Fire HD 7, and the Rosewood Series! Maddie: It just so happens that it’s also Emmett’s favorite treat, but I’d say he’s one of my homemade MoonPies. Now, for those of you who’ve had a MoonPie, they don’t look like much of a gourmet treat on the outside and frankly the ones you get at the gas station really aren’t. They’ve got a reputation as being a little country – but like Emmett – looks can be deceiving and the MoonPies I make in the shop have so many layers of surprising, refined flavors. They’re made with homemade marshmallow cream, sandwiched between freshly baked gingersnap cookies. Then I dip them in a dark chocolate ganache and sprinkle the edges with some crushed, candied pecans. They’re a little spicy and very sweet, just like Emmett. I just can’t get enough of him. Emmett: Hey, folks. So, if I had to sum up Fancy in a drink… she would be imported French Champagne. The good stuff, not some knockoff sparkling wine. She would be a little sweet, a little dry. If you’re not used to her, she can give you a headache. Some people thinks she’s too fancy for everyday consumption, but once you’ve tasted her, nothing else quite measures up. That’s my Maddie in a glass. 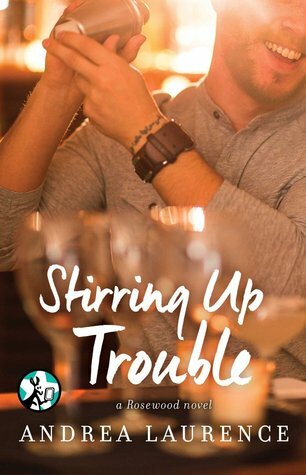 This entry was posted in Author Spotlight, Book News, Book Spotlight, Books, Excerpt, Giveaways, New Release and tagged Andrea Laurence, Author Spotlight, Book news, Book Spotlight, Books, Excerpt, Giveaways, New Release, Stirring Up Trouble.